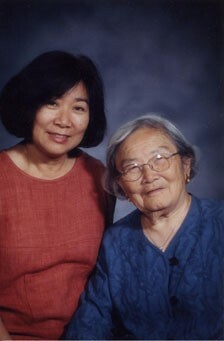 Kayo Natalie Hayashida (now Natalie Ong) is cradled in her mother's arms as they leave their west coast home for a Japanese internment camp in 1942. The tags that hang from their clothing are mandatory markers that identified them by their "Hayashida family number 014." This photo appeared in Life Magazine and an enlarged copy marks the entrance to the Smithsonian Institution's exhibit about the Japanese internment experience. This is the time of year that we join together to celebrate America. It is exciting to march in parades and listen to the band play "The Stars and Stripes Forever." Saluting the flag and reciting "The Pledge of Allegiance" are acts ingrained in us since childhood. When we hear "God Bless America," we are reminded of how uniquely fortunate our country is. We are a nation of diverse cultures, religions, and languages. Our country's gifts are embedded in the multiplicity of our differences. We are patriotic. The troops that fight wars, and their families, know the sacrifices and commitment required of a patriot. But patriotism can be difficult when, even as an American citizen, you are looked upon as an enemy. One of our community leaders and her family experienced a time when they were labeled a danger to the very country they called home. This is their story of resilience, determination and patriotism. Like other residents of El Lago, Natalie Ong enjoys the quiet, tree-lined streets of this small community she has called home since 1969. In many ways, she and her husband Al are living the typical American life — they own their home, have raised two children, collect Steiff bears, pop-up books and space toys, and enjoy the company of their two young grandchildren. Many of her neighbors know that Natalie has an active and determined voice in the community, and that she has initiated many positive changes in the area as El Lago city council member, Mayor Pro-tem, reporter and private citizen. But what many people don't know about Natalie Ong is that, at one time, she was denied the opportunity to live freely as an American. Throughout her adult life, Ong has embraced challenges with a "can-do" spirit and a desire to make the world and her community a better place. She is extremely out-spoken on environmental issues and regularly attends Port of Houston and Bayport Industries meetings, speaking out on quality of life issues. Her influence and efforts paved the way for bike paths along NASA Road One, and she continues her commitment to accommodate bicyclists and pedestrians in roadway plans. Natalie Ong's enormous visions belie her small stature. She is a petite woman, athletically built (her friends tell me she is a tenacious tennis player), with warm, dark eyes and high cheekbones that suggest her Japanese heritage. Many years ago, it was her Japanese ancestry alone that became the measure of her worth. She was born Kayo Natalie Hayashida in 1941 on the tiny island of Bainbridge in Puget Sound, a short ferry ride from Seattle. Her grandparents migrated from Japan in 1904 and 1906 to seek employment and earn enough money to retire comfortably back in Japan. Her maternal Nishinaka grandparents settled into a life of managing and operating a hotel in Seattle, then moved on to Bainbridge Island to work the sawmills and help clear the land for farming. Natalie ' s father Saburo was born in Bellevue, Washington, where the Hayashida family farmed before moving to Bainbridge Island. He chose to make America his permanent home. "When my grandparents were ready to return to Japan in the early 1930s, only the younger children accompanied them. The older ones had no desire to move to Japan - leaving a life here to immigrate to a country they did not know. " Over the years, hard work and successful farming allowed the now-merged families to buy, rather than lease, farmland for growing mostly strawberries. Her mother, Fumiko, kept busy raising Natalie and her brother, who was almost two years her senior. Their life on the island was demanding but fruitful. They enjoyed a closeness with their small community, which included many other families of Japanese descent. America was the only home the young Hayashida family had ever known, and a place of promise for the migrating generation before them. Everything changed on December 7, 1941, when their peaceful life exploded with the great tragedy that was Pearl Harbor. The horrific events of that infamous day sent shockwaves across the ocean to Bainbridge Island; its ripples instigating a second tragedy that would alter the lives of Japanese-Americans living on the west coast of the United States. Fumiko Hayashida now 93 years old, remembers receiving the news of the bombings. "There was no television in those days," she recalls. "It was on a Sunday and my brother-in-law came over and said, `War has started with Japan.' So we turned on the radio and sure enough, they were blasting away. " As an American citizen, Fumiko says she felt safe within the borders of her country. "Naturally we were pro-America, and we felt that the small country (Japan) could not tackle the U.S. "
She remembers being concerned about her parents and younger sisters and brother who had returned to Japan. "After America declared war, I wondered how my family in Japan would survive, " she adds. Their family faced their fate boldly, first learning of the government's demands in the local paper. "Citizens or not, we were all ordered to evacuate and had only one week to get ready to go," she says. Rumors began to fly. "We had heard we were to go to Manzanar, California , " Fumiko says. "W e'd also heard we may be killed." Their local sheriff / friend paid them a somber visit and apologized on behalf of the entire country. Their numbered days passed quickly as they waited with uncertainty to be collected for their crime of being Japanese. Fumiko carefully selected items to pack into one suitcase for each family member – the allotted baggage they had been told to prepare. At the same time, she also learned that she would be preparing for the birth of her third child. "When I found out I was pregnant again I was so mad!" Fumiko exclaims, laughing now at the predicament she faced as a young woman. " We didn't know where we were going, how long w e'd be gone, or what would happen to us and our children, " she adds. Bainbridge Island was the first group of Japanese-Americans ordered to evacuate. "It was such a small island and we were all friends , " Natalie says. " 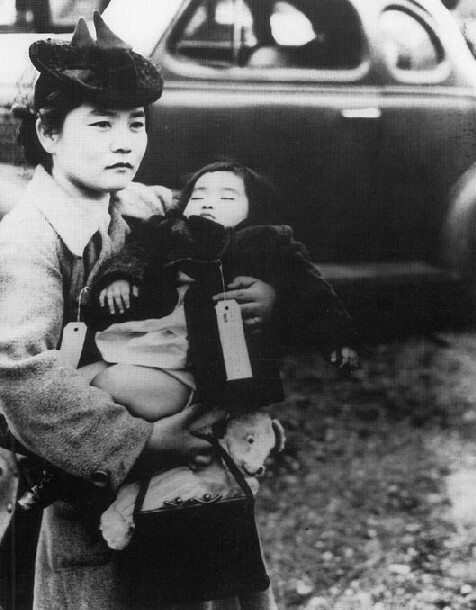 They knew all of the Japanese families, so they could easily identify everyone who was Japanese." On March 31, the Hayashida family said a sad and uncertain good-bye to their home, their farm and their friends. Along with their baggage, they were tagged with family number 014 and ferried to Seattle, where they joined 160 other Japanese-Americans and boarded a train to travel to their unknown destination and fate. Fumiko's two sisters, Shigeko and Nobuko and their nine children accompanied them. Their spouses were sent to a different camp in Montana because they had been born in Japan and were "Issei's" (pronounced EES-say – the Japanese word for "first," meaning, the first generation of Japanese citizens who had immigrated to America). Fumiko ' s husband was allowed to remain with his family since he was a " Nisei " (NEE-say – a second generation Japanese American). He became the surrogate father to his nieces and nephews in the absence of their own fathers. The trip was Fumiko's first venture out of Washington and her first train ride. She recalls getting very little sleep that night. The children kept her busy, leaving her little time to worry about their future. " I don't know how we did it, " she says. "In those days there were no disposable diapers, nothing like that. And we left almost everything behind us. " The next day they arrived in Manzanar, California and stepped off the train and into a hot, dry and dusty desert that was nothing like the lush farmland they had left behind. They were ushered into the unfinished barracks that would be their new home. Manzanar was modeled after an army base designed to house single men. The barracks had no running water, no kitchen or bathroom facilities and only one light bulb and cots with straw-filled mattresses. Fences topped with barbed wire and gun-carrying guards secured the compound. In spite of the deprivation of the camp, Natalie and her mother recall the sense of community that formed among the detainees. Children played with each other in the dirt and with boxes that the men gathered to make into makeshift chairs and tables. Meals were eaten in large groups in the mess hall and latrines were shared by the families. They both agree that they made the best of the situation. Fumiko recalls that the hardest part of their internment was trying to make sense of their country's distrust in the Japanese-Americans. "I just never could understand it," she says. After one and one-half years at Manzanar, all of the family members were transferred to another camp in Minidoka, Idaho, near Twin Falls, where they joined another sister and her family and others from the Seattle area. Under similar conditions, they lived in Idaho until 1946, when the war ended with the bombings of Hiroshima and Nagasaki. Nearly four years after their lives were interrupted, the Hayashida family was permitted to return to their home and land. "The children were so excited when they got back to our home, " Fumiko recalls. " They ran upstairs and downstairs and all around. They weren't used to the stairs or that much space " . For the parents, it was a bittersweet homecoming. There was no time for celebrating. Their house was in disrepair. " We had no money coming in while we were gone and we had to start all over again," Fumiko explains. Fortunately, the Hayashidas owned a home, but they had been unsure if it would be waiting for them in the event of their release. "While we were gone our home was not insured. After the war started, insurance companies started canceling us, our car insurance was gone, our homeowners was gone, no company wanted to take us, " Fumiko says. The family had to get busy right away, picking up their lives where they had left them. Natalie, now five, was enrolled in school with her brothers. The 60 acres of land required plowing and planting, but it would be some time before their strawberries could earn them a living. "Strawberries can't just be planted and harvested in six months, " Natalie explains. "The first year they're too small. The second year they may be good enough to send to market but it can take three years before they are really good. " The land proved hard to farm and Saburo was getting older, finding it difficult to keep up with the physically demanding requirements of farming. The strawberry fields were never again very productive for the family, and in 1951 he went to work in Seattle as a machinist for Boeing, eventually moving the family to Seattle and leaving the farming to his brothers. As Fumiko finishes her story with remembering her husband, whom she lost in 1986, her eyes fill with tears and the emotions of that most difficult time in her life are released. After a moment of contemplating Natalie's words, Fumiko adds her own final thoughts, "War is no good. Not good for anybody." She has learned this lesson firsthand.